Welcome back to Our Creative Corner. It is with utmost pleasure that I present to you this Thursday all the way from Austria, a lady who will amaze you with her mixed media projects on her Blog, and by what she has created for you today; as it is truly beautiful. 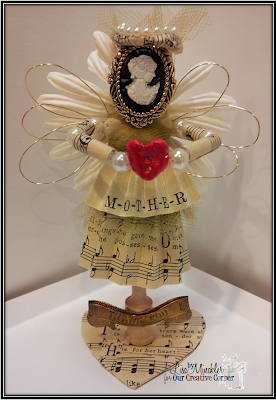 We are so thrilled to showcase her work, but first let us learn a little bit about her. 1.) ‘Where do you Live’? 2.) What if anything, do you consistently draw inspiration from? As I am very much a visual person, I gather (and store) impressions almost everywhere. These may be certain combinations of colours or textures, impressing faces, that tell whole live's stories or unusual combinations of subjects, that arouse one's attention. I have a specialized look for tiny details, I guess. That's why I also love macro photography very much as well as doing small crafting objects or painting small formats rather than large canvasses. So to say I draw inspiration from nature and everyday life and it’s "small everyday wonders". 3.) List five blogs that truly inspire you? 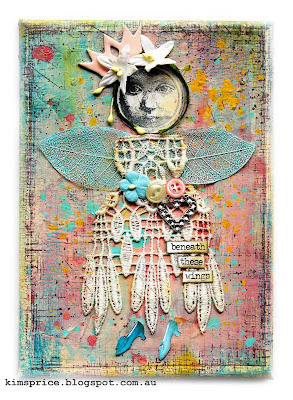 froebelsternchen.blogspot.co.at always inspires me, as she uses Mixed Media in so many creative ways. 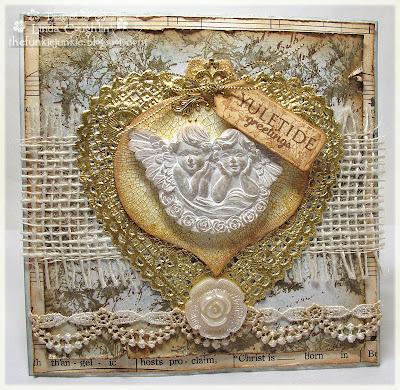 "Mixed Media and more" is totally up my alley and I so love her booklets and wonderful ancient looking objects she creates out of simple cereal boxes and other stuff. "Anina Papirckalnica" - a treasure box to me. ...to name only five of a whole bunch of blogs I love to visit regularly. 4.) How would you describe your art for the general public audience if they have never seen it before? 5.) What other hobbies or talents do you have that you'd like to share with us? From time to time I collect old cut-out-sheets, paper dolls and paper theaters, which - when assembled - I show on my other VonPappe-blog , I am interested in photography, but at the moment pausing at it (don't know exactly why). Images can be seen at my photo-blog "sightings"
and sometimes I write (mainly children's) poems, which I also publish on "Bert-der-Bär". 6.) What is the most useless item that you have purchased for your craft? It's definitely the tray for embossing, which I bought after having knocked over the tin with my precious aged copper embossing enamel. (I got it all back from the floor, using shovel and broom, but I then had to pick out a lot of white dog's hair with tweezers, before it was of any use again...). I had used a simple sheet of paper before and have gone back to it, after the tray always gets static. And here is what Claudia presented us with! Thank you, Claudia for being our 'Thursday's Top Talent'. 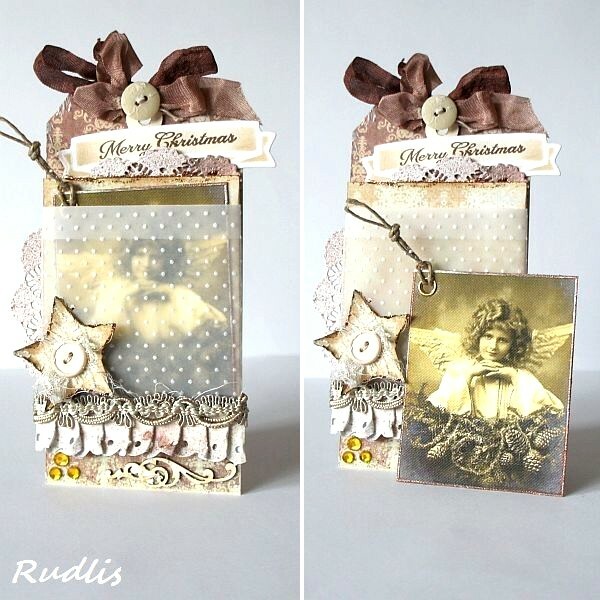 and sharing such wonderful inspiration with us!I have only shown you half of the photos of this Box! If you want to see more please pay her a visit. 'Top Talent Thursday'. 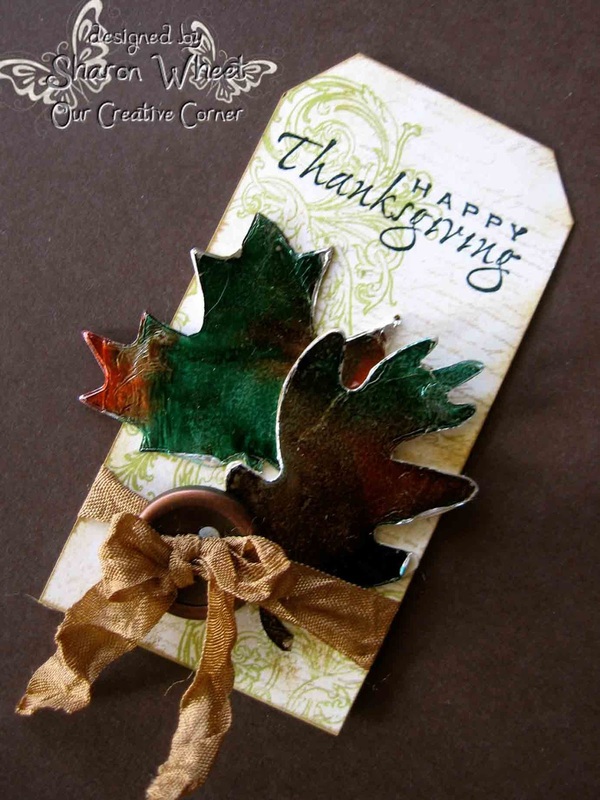 at Our Creative Corner, simply join in our current challenge here. 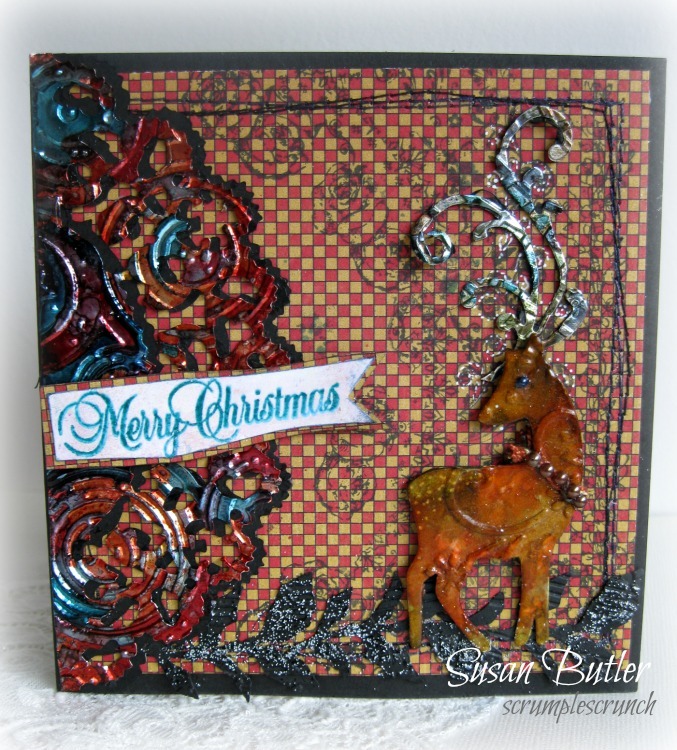 Winner: Foil and Alcohol inks! Unfortunately there can only be one winner. 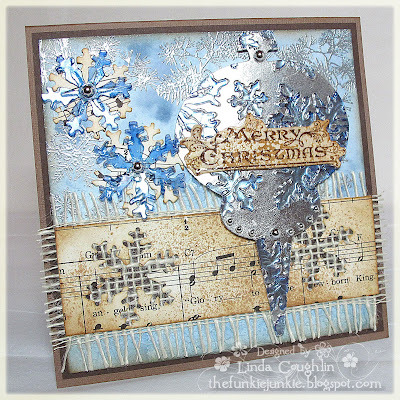 Congratulations Dawn, your die-cut inked foiled frame in purple hues is radiant and dominant, it relates a complexity of colours embracing a diversity of undertones linked with artistry and uniqueness; Santa looks great! If you want to know the details on this card, unfortunately it is not on her Blog as she uploaded it onto her Flickr Gallery. So you will have to ask her if you want to know how it was made! Please feel free to upload this button and display proudly on your Blog. Just a reminder that Irena's- A.B.C. Challenge finishes this Saturday, so you still have time to join in, and have the chance to be our next Top Talent! 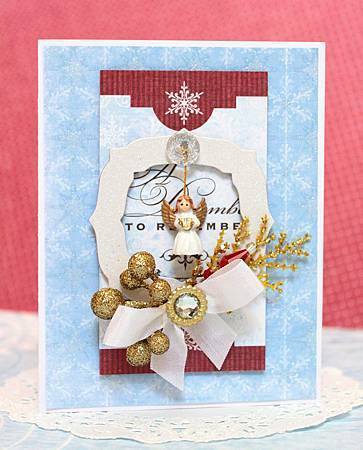 Hi there and welcome to another fun weekly challenge here at Our Creative Corner! 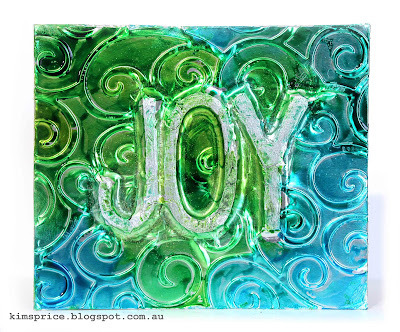 Thank you to everyone who participated in last week's 'Foil and Alcohol Inks' challenge. So many wonderful entries were shared. 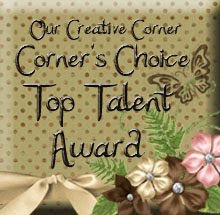 Please stop by on Wednesday, to see who will take home the Top Talent Award for that challenge. Use in your project, these three things and show where they are. I hope you'll join the fun. However, please keep in mind: total number of Challenges you are allowed to enter is: FOUR, including ours! 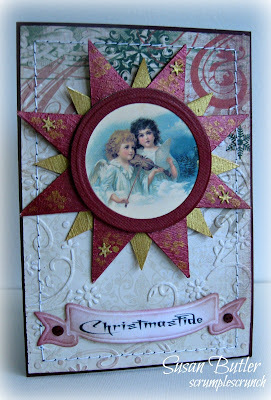 Angel image, Buttons, Chipboard Stars. The thrill for me, is Chrissy is from NZ, and as you all know I am too! You are privileged to have two Kiwi's, one presenting and one showcasing..... How lucky are you! So without further discourse from me, let us learn a little bit about her. 1.) Tell us, where do you live? I live in Beautiful New Zealand…Napier, on the East coast of the North Island..
My daughter was impressed with some cards she found, and wanted to start card making, so I joined her about 5 years ago now…she quit…I didn’t…but I did venture off into another direction with scrap booking….but then came back to cards 2 years ago. 3.) If you could have anything you wanted, what would it be? 4.) We all make mistakes!!!! !what is the most common word you utter instinctively to ease the crisis? Is this an R18 blog…maybe PG should be recommended…but my usual comment is a very loud “YOU IDIOT”…and bang the desk.. which makes the dog look up and the bird shudder.. lol.. I’m very loud…then I say “CALM”….BE CALM CHRISSY and sort it out quietly...CALM is my favourite word. 5.) Is there anything unique you would like to share with us about yourself.? Don’t know if I’m unique in anyway…But I do have the ability to make people laugh and feel better very quickly…as a caregiver you have to be happy don’t you.. not one of my clients are sad anymore…and I’m proud to say it is because of me…poor devils don’t get a chance to be unhappy…lol.. I wing my way everyday…I never sketch or choose papers first or pre decide what colours I’m going to use…if a new image comes along I just do it.. ideas just pop into my head when I sit down..
My cards are pretty simple and they take from, starting to colour to propping up on my side board ready to photograph…probably an hour or less.. depends what’s on TV.. The fancier ones can take half hour longer I suppose…I like to make 1 card a night if I can…to keep ahead for DT commitments.. I’m on seven…so pretty busy. Commendable cards Chrissy and thank you for being our 'Thursday's Top Talent' and sharing such wonderful inspiration with us! If you want the chance to be part of Top Talent Thursday on Our Creative Corner, then just join in our current Challenge here, you still have some time to participate. Winner - Make your own Background. My appreciation to all who entered is measureless, as all of you did me and the team at Our Creative Corner proud; Thank you very much. The creativity that was on display was inspirational, and I know I had a gripe about the number of entries some of you had entered, but it was only due to frustration on my part I hope I have not put any of you off. This is a delightful mix of warm and cool shades; a muted palette. It relates a low key, yet natural complexity that pulls you in, the dominating theme is a comforting softness and warmth. A beautifully designed background. 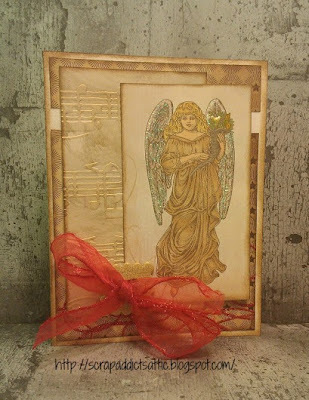 Just a reminder that the 'Foil and Alcohol Ink' Challenge is still in progress, you still have time to participate, and be in with a chance to be our next Top Talent! Please join in and submit your entry. Foil and Alcohol Inks Challenge. Welcome to Our Creative Corner. 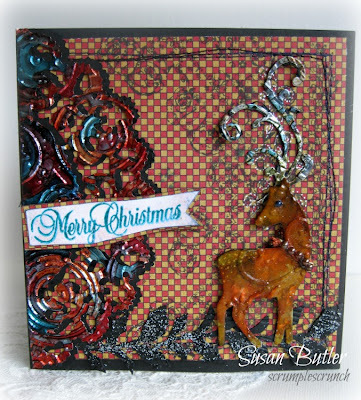 Susan here again to inspire you for another week, with some dazzling creativity not just from me but from my teamies as well. Before I get into the business of explaining the Challenge for this week, I have a little gripe! And I can honestly say I do not gripe often, but today I am going to have a gripe! So please read the post! Last week we had some amazing entries and I was impressed at the talent and quality of work that was on display, it was exciting for me to see such wonderful backgrounds, and very inspiring, and there were many winners, but every-time I thought 'this is the one' I had to disqualify because the entrant had participated in too many Challenges!!! It is a rule that we have made of late and it has to be adhered to .......... Please follow this rule we have set, enter your amazing projects and have the chance to be our next Top Talent, where your Blog and creations will be spotlighted. The technique of dripping Alcohol Inks onto Foil has an amazing effect. The item you make can be anything; a free standing decoration, or an element to place onto your project, experiment and have some fun, it is getting close to the silly season, so why not let go and free all those inhibitions and let rip with some colour! Be inspired now by the design team, that I have the privilege to work with. Foil Doily with Alcohol Inks applied. 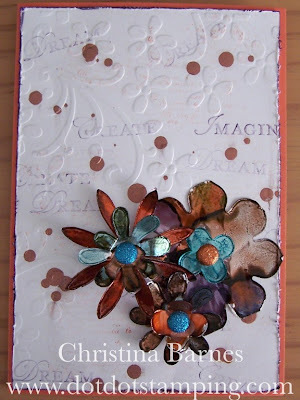 Flowers have been die cut from foil and then coloured using Alcohol inks. Labels: Foil and Alcohol Inks Challenge. Please welcome and congratulate our Top Talent for this Thursday, all the way from England; KIM (kimx). who was the winner of our 'Lets get Country' Challenge. We are thrilled to showcase her work for you today, but first let us learn a little bit about her. Whyteleafe. It is several miles outside London, but quite near Croydon. life, what would they be? Oh Boy, only 3, I'm not sure that I could narrow it down to just that!!! heat gun) to be able to do it, so that would really restrict me. 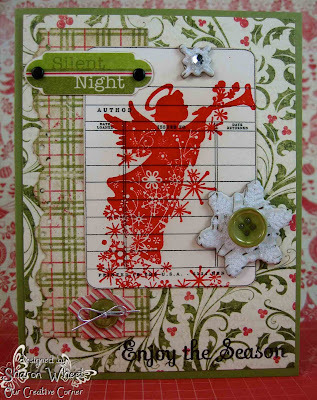 able to use my inkpads to colour in my stamped and embossed images. 3.) What color inspires your creativity? background papers that you find in Craft stores. own. but still I NEED, I WANT, I HAVE TO HAVE. look at and feel, now that would definitely inspire my creativity. given how messy I am, getting it on the carpet is always a possibility. to be going through a bit of an orange phase at the moment. 5.) If you have lost your Mojo, how do you go about getting it back? magazine is a great way to inspire me. 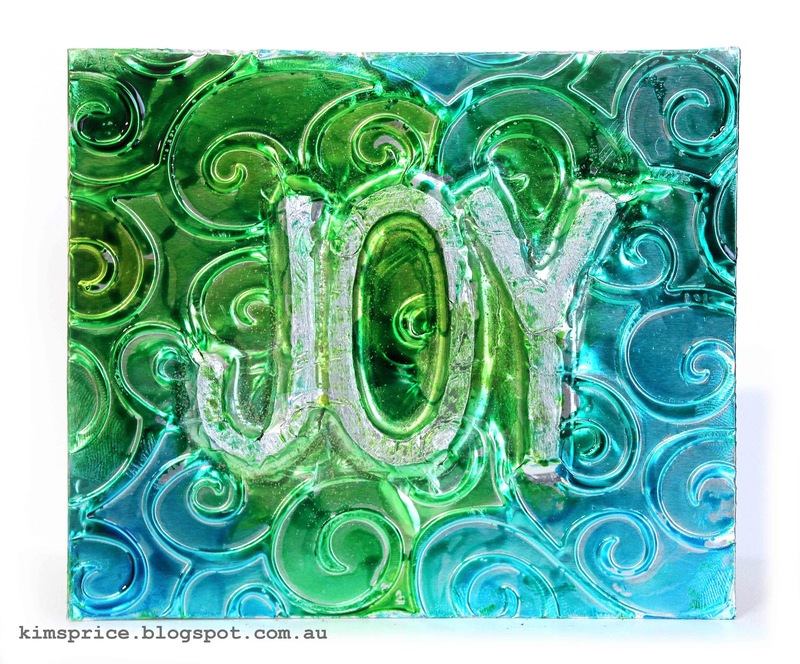 a trip to Blogland to visit some of my talented blogging chums. 6.) How long have you been crafting and what made you start crafting? 7.) 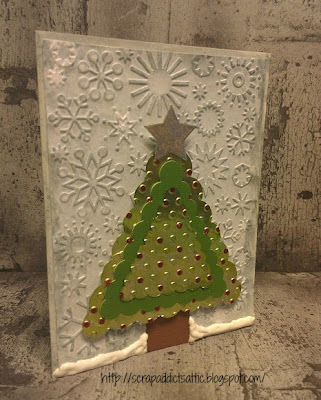 What is your favorite holiday/event to make crafts for? I just love making cards so I really don't need an excuse to make one. made especially for them, that always gives me a buzz. Thank you, Kim for being our 'Thursday's Top Talent' and sharing such wonderful inspiration with us. 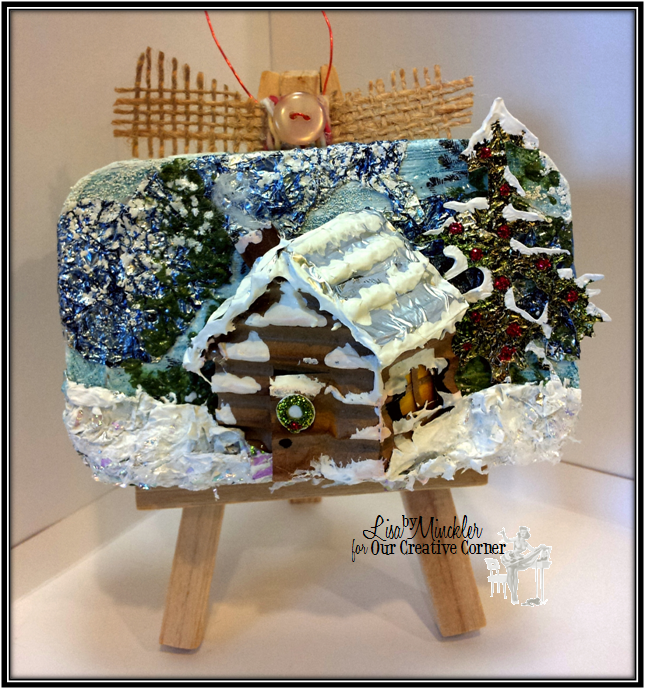 at Our Creative Corner, simply join in our current challenge here. Happy winner's Wednesday everyone! 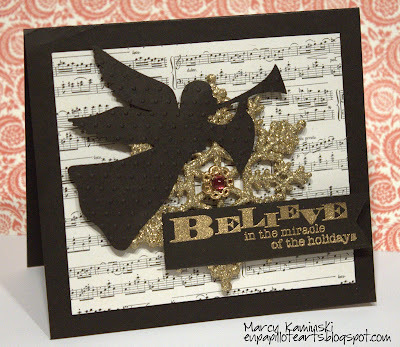 I'm Marcy Kaminski, here again to announce the winner for last week's "Silhouette" challenge! We appreciate the amazing entries for this really fun challenge! Thank you all for your creations! 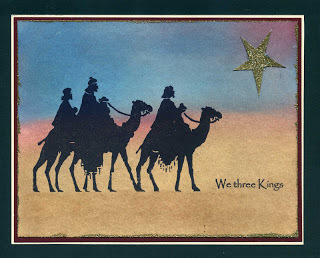 Our winner is Joan W, whose amazing card was a standout, using color and composition to exude a serene effect. So well deserved! Congratulations, Joan, on being our choice for TOP TALENT! Feel free to take our badge to display on your blog! It's not too late to play along with this weeks' fun challenge from Sue, "Make Your Own Background." Please make sure you link back to us when you post your submission. Don't forget to come back and check out our Top Talent Thursday tomorrow! We shall return with a new challenge on Saturday, and tons of inspiration for you. Until then, happy crafting!